Antarctica may not be the most opportunistic destination for aspiring expats, but what genuine explorer hasn’t fantasized of visiting the Southern continent? Courtesy of Ecoworldly, you can catch a glimpse of what it’s like to actually live there. 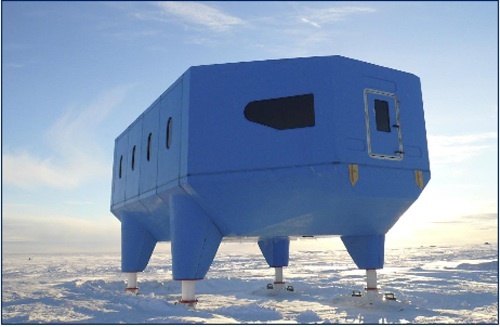 The article was written by Antarctic researcher Agnieszka Fryckowska from her chilly home in the Halley Station on Antarctica’s Brunt Ice Shelf. The station has been operational since 1956! Fryckowska is one of 10 who are housed in the station for the winter season. That means they are left entirely on their own from late February when the last supply vessel departs from the edge of the ice shelf, until late October when the first planes arrive. Starting in May, the station experiences 105 days of total darkness. It may sound bleak to some, but what an adventure! Complete with trips to visit nearby Emperor penguin colonies, witness otherworldly landscapes, and experience what self-sufficiency truly entails; living in Antarctica is certainly a chance to earn some serious expat cred.